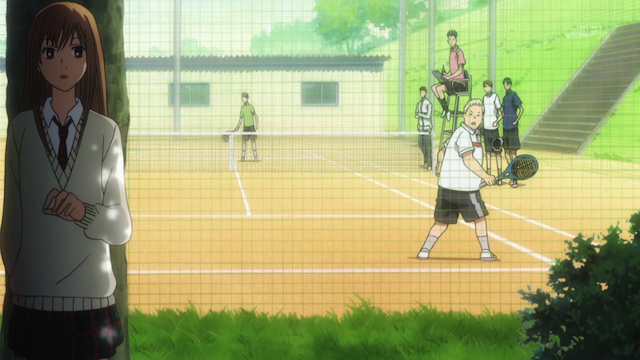 Episode 8 of Chihayafuru brings an unexpected twist. A person from Chihaya’s past appears, and Arata’s long shadow continues to cloud the hearts of those who once had the courage to oppose him. Get your sneakers and sweat bands on! This time we’re taking Karuta to the tennis courts. 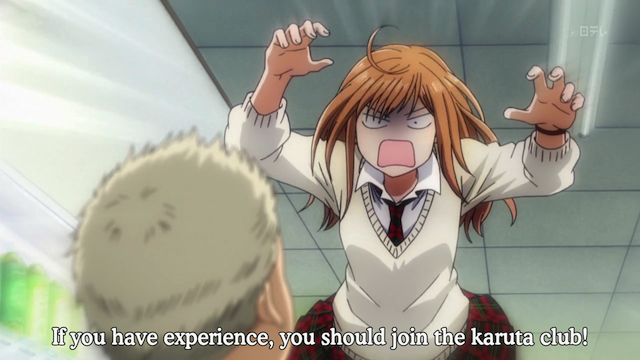 Chihaya Ayase still needs one more member to get the Karuta club recognized by the school administration. Surprisingly, her direct recruitment style isn't well received. 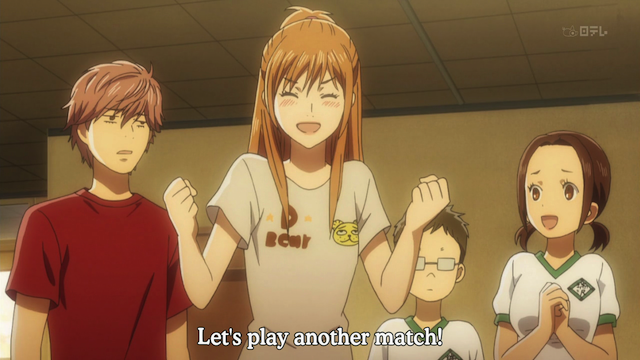 Even more surprising, she recognizes a fellow student, and current Tennis club member, as a former Karuta player, against whom she, Taichi, and Arata competed. Chihaya seems to be pretty good with faces, as she almost instantly recognizes a student as having been the number two ranked grade school Karuta player for all of Japan. Unfortunately her memory for names isn’t quite as good, and she insists on calling him “Pork bun” throughout the episode. 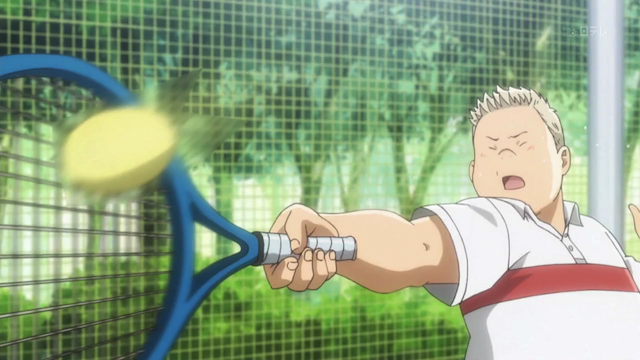 Yuusei Nishida, AKA "Nikuman" (Pork bun), burning up the tennis court. Arata Wataya. 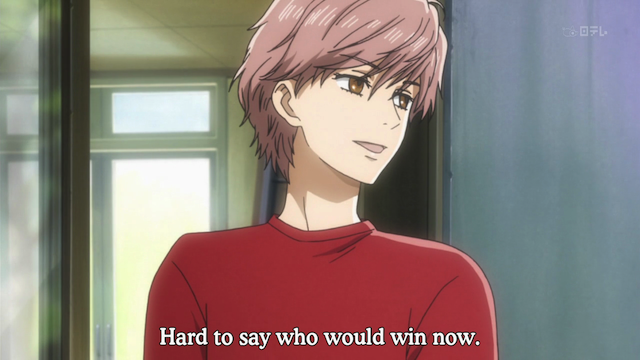 For a character who doesn't bother to play Karuta anymore, he sure has made a big impact on his peers. Just like Taichi, Nishida gave up Karuta because he lost faith in his own abilities after being crushed by Arata’s awesomeness. 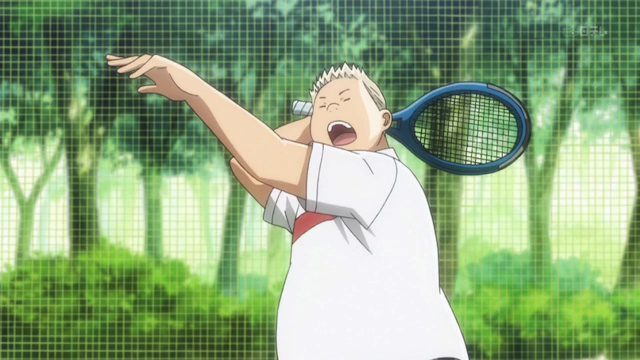 Chihaya recognizes, however, that even in his tennis game, Nishida is using the 100 poems, to help him with his timing. She confronts him with this, saying, in essence, that he is “cheating on” Tennis, because he still has Karuta in his heart. Taichi Mashima shows that he still knows how to tease and manipulate the other kids. We finally get another full-fledged match: Nishida vs. Ayase. 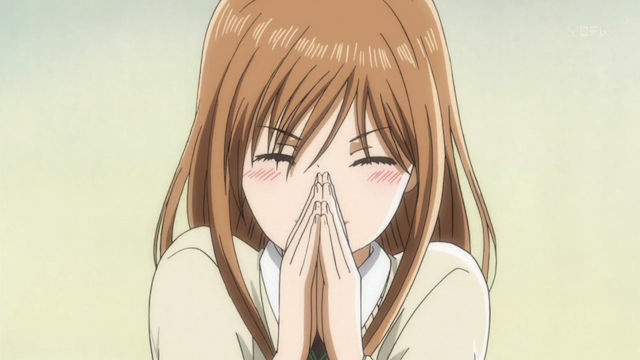 Nishida is eventually convinced to play a game against Chihaya. Unlike all recent games we have seen, in which the recitation was done by a recording, Taichi performs the recitation from yomifuda (reading cards) which gives this match more formality, and a bit of added intensity. As usual, I like the way the match was animated. I find it very amusing that they pay so much attention to one of the aspects of Karuta that seemed most peculiar to me, when I first started looking at videos of actual gameplay: frequently a player will knock the card so far out of the playing area that they will have to get up and walk over to retrieve it. This seemed at first to be a mere interruption in the course of play, but it typically takes up a lot of time in any given match. Tsutomu Komano (left) and Kanade Ooe (right) talk Karuta strategy. Another great thing about this match from a sports anime perspective, is that we finally have some knowledgable spectators commenting on the game. 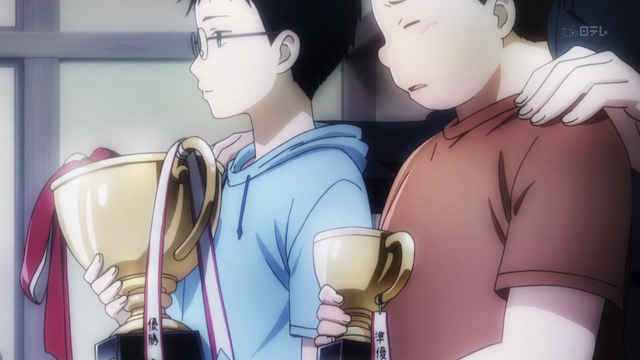 I see this as a critical part of Chihayafuru growing into the sports anime genre. 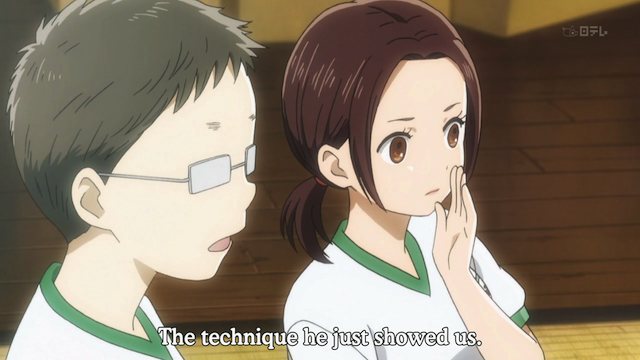 If you look at classic sports anime, there are always people on the sidelines who are actively following the game, who give timely insight into traps, decisive plays, where things currently stand, and so on. In shows like Hikaru no Go and Shion no Ou, there was a special room in which professionals and pre-professionals discussed the game, playing out alternate moves, and simply giving reactions to what they saw on closed-circuit television. In Prince of Tennis, this role was played by a combination of teammates, the coach, the reporters covering the matches, and a couple of fans. 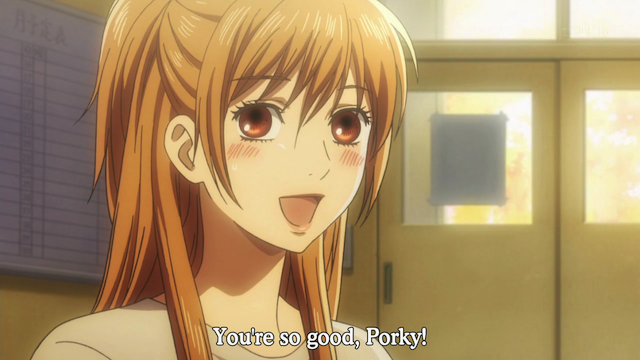 Chihaya demonstrates how to praise AND insult in a single sentence. Long story short: Chihaya’s intensity when playing Karuta reminds Nishida of how much he really loved the game, and the fifth member is acquired, which means the club can now be made official. 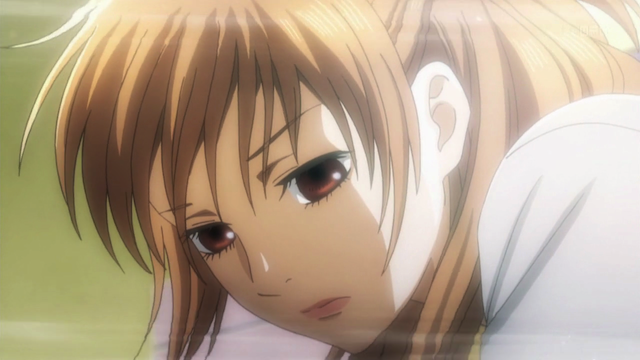 This series started with Chihaya’s uphill battle to find a group of friends with whom she could play Karuta. We then got the flashback arc that provided the rationale as to why it was so important to her. 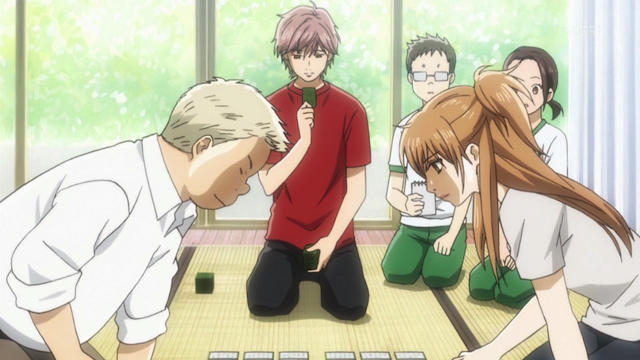 Then we had everything falling apart, as Taichi and Arata refused to play Karuta again. This eighth episode, therefore, is a kind of conclusion. She finally has a group of Karuta playing friends. Although some obvious questions (especially regarding Arata) remain unresolved, the show is now open to explore new directions. Tournaments? Romantic entanglements? 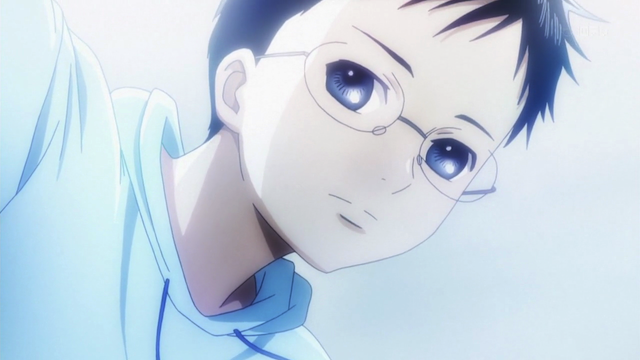 I’m certainly looking forward to seeing where Chihayafuru takes us next. I think it’ll be interesting to see how Arata plays a role in the rest of the series. It seems that he’ll be stuck in (forgot the name of the town) for a while, since him transferring to their school seems a bit contrived. It looked like he was going to be part of a love triangle, but with Chihaya as clueless as she is, I imagine that the romance in this series is going to take a lot of volumes to flesh that aspect out. I think you are probably right. Of course it wouldn’t be a proper triangle if Arata came back now, as Taichi seems unwilling to make a move. If it takes Arata a while to re-enter the picture, it might give Taichi enough time to catch Chihaya’s attention. They’ve done such a good job with everything up to now, that I feel completely comfortable with whatever happens next. Yes, it feels like everything is in place for this show to take the next turn. It’s already fooled me a couple of times, so where it’ll go next…I have no idea. Which is GREAT!!! That ability to surprise can really make the experience. Surprisingly, her direct recruitment style isn’t well received. Indeed. And yet, it works, haha. Like you, now that the key players are all assembled, I’m also looking forward to the next arc. I just hope the current Arata is actually in it! Also, I liked Taichi in teacher-mode making the effort with Kana-chan and ‘Desko-kun’ at the beginning; nice to see him maturing as the show goes on. They could go in so many directions from here, and they still have plenty of time left (if I remember, they are scheduled for 24 episodes).